They used to call themselves I Forget until a few forgot the name, they quickly scrapped it for the Wild Bunch. 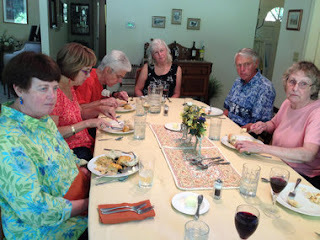 share a meal together last month at a Lake Oswego home. This is definitely the wave of the future. The nearby future. Alzheimer's patients and Alzheimer's caregivers coming out of their caves and getting together on a regular basis. There is an increasing understanding that we, the Alzheimer's Community, are going to have to care for each other. Five years from now this will be a common occurence.